Are the install instructions on the description page still accurate? Its a DLC_CON file so wouldn't it want to go into "Mass Effect 3\BIOGame\DLC"? Thanks! Yes, that is where you want to put it. I updated the description to be clearer. Your WarrantyVoider's DLC Patch dlls link leads to virus/ransomware. I've updated the description with a better download link. You may want to add Kenneth and Gabby as Points of Interest on the Citadel map so players know when to go to Purgatory. Also as someone stated earlier EGM wrecks the purpose of this mod because they recreate the email to pardon Kenneth and Gabby. The only way to "resolve" this is to move this mod or M3RE higher up the mount priority to override EGM <cue rage about changing mount points> or swapping out the appropriate files in a compatibility mod. You could make it a bit more sotry-friendly by editing the original Spectre pardon and removing the "... and reinstate them aboard the Normandy". 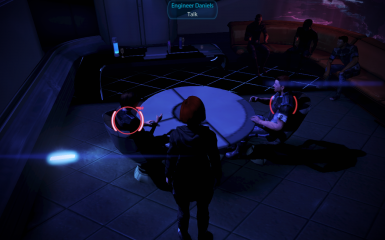 Aria (or Liara) could send Shep an email that he/she has a couple of old friends hanging out in Purgatory that he/she may want to talk to after pardoning them (removing the action of directly sending them to the Normandy of course). This mod shares the file BioD_CitHub_WardsFlux with ME3Re, anyone have any experience of whether they are compatible? 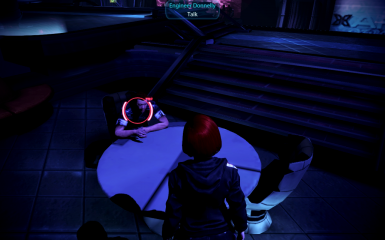 This mod is included in ME3Re. Hi there. I'm also not getting the email or them. When are they supposed to trigger? Someone said Palaven then another said Tuchanka.?!? Im kinda curious to know when/where/WHY EAware got rid of this little scene?? Hey SirCxyrtyx, in Mod Manager 4.2.3 I have added the ability for users to generate GUI mod compatibility packs. It works for all of their installed mods, so you no longer have to post a version for SP Controller Support. Appreciate you making one in the meantime though! Are there any SP controller users who wouldn't be using Mod Manager, or is that required? Installing that mod requires mod manager. Its quite a bit more complicated than a simple dlc mod as it has to load before the splash screen and deals with testpatch. Do you have a guide to generating a compatability pack I can link people to? Hello There, for me, Mod Manger recognizes the conflict, but when I try to create a compatibility dlc it results in an error... so cannot fix this conflict that way, and so Ken&Gabby do not appear at all. Would it be possible just to add a compatibility patch since it's a common conflict. Thank a lot very much for all you time and effort, you are all really amazing people. Compatibility packs only fix for one mod, if you use multiple it will look almost always still override. I used this mod on my own play through last year and no issues, but now for my wife's Ken & Gabby just don't show up. The main difference is she is using the SP Controller mod and has some added FemShep closet stuff but the MEHEM & Citadel Epilogue stuff is all the same as I used. When I remove the mod from the DLC folder, she gets the email in the Spectre terminal, but with the mod installed, no email and no Ken & Gabby in Purgatory. any ideas? Looks like SP Controller mod edits some of the same files as this one, making them incompatible. Thanks for letting me know. I'll see if I can make a compatible version. What would I need to look for to test for the SP Controller Compat version? You used the GUI transplanter tool? Great mod! Add just that little bit extra to the game, especially if you're a fan of Ken and Gabby like I am. Thank you!